F is for Frog Alphabet Print is a great nursery & baby shower gift, as well as really sweet general: “I love you, my little Froggie” token of affection. When a Frenchman asks you to use a certain word for an amphibian that hops what do you do? Ya make an F is for Frog silly! Continuing my alphabet series, I present a Francophonally requested lil Ribbit. Ayup. True story. It’s my long distance request fulfillment of an educational art print folks. Hippity Hoppity. 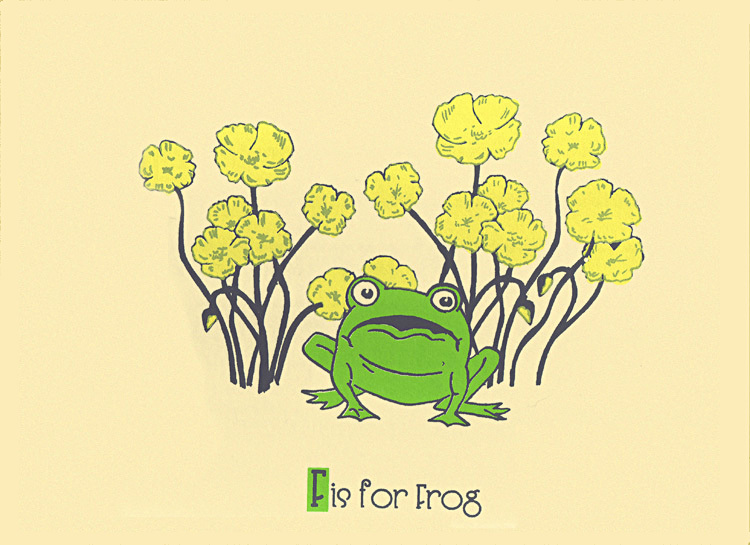 3 colors with Frog green, bright yellow and grey hand-mixed and non-toxic water based silkscreen inks. Edition: Open, with each print hand signed, and titled. Size: 11 x 14 inches (27.9 cm x 35.6 cm) I love the deckled edges of Stonehenge so I leave the deckle edges at the top.